Bang & Olufsen unveiled the Beoplay E8 wireless earbuds on Thursday. Each earpiece has a 5.7mm dynamic speaker, connect to a host device with Bluetooth 4.2, with touch controls on the surface that projects from the user's ear. Battery life is rated by the company at about four hours. The Beoplay app allows for fine-tuning sound, and to apply sound profiles for different user activities or environments. The Beoplay E8 comes with five ear tips, a charging cable, and a leather charging case. Retail price is $299, with replacement earbuds available for $129. Shipments are expected in October. Sony's WF-1000X has 6mm dome drivers, and implements the company's "Adaptive Sound Control" that observe the user's actions and automatically switches the noise cancellation feature on or off. Battery life is rated for three hours, with the battery case providing two charges. Sony's offering is closer in price to Apple's AirPods, coming in at $199. The headphone connect app will be available at some point in October. But but but — “AirPods are too expensive and have bad battery life!” Oops, yeah now they’re looking even better. That sounds about right. lower qiuuality against lower quality go for fashion. I do not see my headphones, but I hear them and feel them (hurting my ears). Not the way this device is meant to be used. And then there's Sony and their version (almost literally!) of the HomePod. Yikes. I can't believe how fugly the B&O earbuds look! I used to be a huge B&O fan (and still have a wonderful sound system of theirs that I bought in 1991 that's in perfect working condition -- although the technology is now quite dated) and have a B&O system in my car that delivers great sound. But it's clear that they don't have the design chops that they used to. It's really sad to see. Eh? The AirPods look and sound better, and have WAAAAAAY better battery life. Reviews all around on the Gear Icon X are poor. The Sony buds remind me of hearing aids from the 1960s, except they're black. I can see people shouting at wearers of these things, assuming the wearer is hard of hearing. It’s not necessary to shout at the hard of hearing who are wearing hearing aids, since they’re, you know, wearing heading aids. I don’t think people will do it here, either. I give no such credit as I see little value in those features - I don’t want to manage onboard audio libraries on my headphones, nor do I expect its activity tracking to be as good as a dedicated device’s. Huh? Speak up, I can't hear what you're sayin! '... at least on paper..."
I would say that's the Sony version of the Amazon Echo, a product that you can purchase today, and that Apple it's copying too. You don't need to have the AirPods to see how they look. Personally, I think they look more to an electric toothbrush head. B&O and Sony have a few things better than AirPods. B&O have multiples size ear tips, so it will have better sound isolation. And based in the B&O product line, there is a chance they will sound better than AirPods. 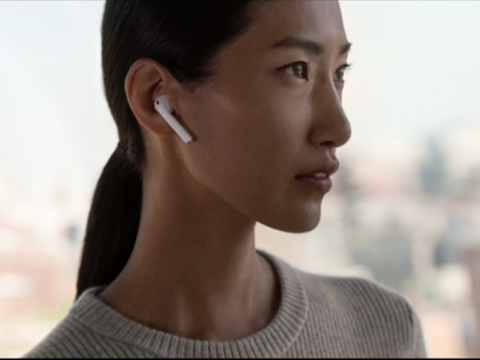 And IMO, they are more discreet and looks better than AirPods. And Sony have noise cancellation (maybe that's the reason of their poor battery life). As soon as you try the three options, you'll truly see which one is the best. Price and battery life is not the whole story. I can't speak for these new products, but AirPods just don't have good sound. They're cheap earbuds that have been made wireless. I have the AirPods and really enjoy them. I'm looking forward to iOS 11 to address my only complaint and that is being able to select different actions for each AirPod. One will now activate Siri and the other will go to the next track. They have great sound for anything not sealed and that is the point. I can use different headphones when I want deeper bass, etc but most people seem to use the Airpods for being out and about, going to the gym, running, etc. The bit of ambient noise keeps you safe in those scenarios. People can complain about the two sticks or qtips or whatever they want to say derisively but they work and the double microphones with automatic selection works great for calls and siri. I love mine and also thought they were a joke when I first saw them. However the wife had interest and when we went to the Apple Store to purchase them, we tried them on and instantly bought two pairs. There is a clear reason why Apple can't keep them in stock. They work well and sell themselves. Personally I think they have great sound for what they are (i.e. such a tiny speaker and tiny battery working over Bluetooth). Anyone who wants brilliant heavenly sound quality wouldn't be buying this type of product anyway. It has Assistant in it - it's their version of Google Home, which was Google's version of Echo. Does it take design cues from HomePod? Sure. Did HomePod take design cues from other products, e.g. Whyd? Yes. You do, because you don't know how they look IRL until you've worn them or see them. Case in point -- Watch looked HUGE in all the photos, so much so that I ordered the 38mm. Then I saw them in person -- realized my mistake because they were much smaller than the photos made them out, and ordered the 42mm. Same with the headphones. Especially the clickbait articles that intentionally wear them incorrectly to make them stick out in an unusual fashion.